Made by Glasswear Studios. 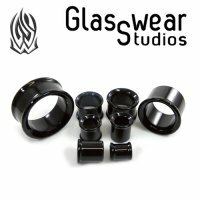 This pair of Black colored eyelets are made from Pyrex (Borosillicate glass) and come in sizes from 1/2" to 2". These eyelets are hand made and all sizes are approximate. Single Flare eyelets come with o-rings and have approximately 3/8" wearing surface. Double flare eyelets have approximately 5/16" wearing surface.